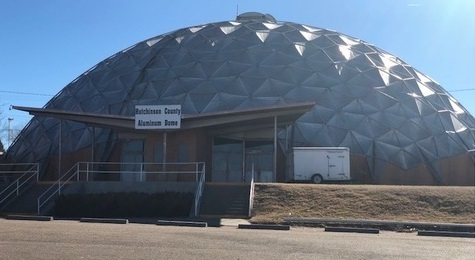 In December 2018, the Dome, along with nine accompanying acres, was graciously transferred from Hutchinson County to the City of Borger. The city has started initial planning to rehabilitate and renovate the Dome for conversion into an event and convention center, a project that can be paid for using Hotel Occupancy Tax. Effective immediately, reservations for the Dome will be managed by the city and no longer handled by Hutchinson County Library. Beginning January 9th, 2019, the public can call the Johnson Park Youth Center at (806) 273-0987 for bookings. You can also find information on booking, along with an online request form on the city’s website at www.borgertx.gov. The Borger Aluminum Dome is a geodesic dome that was built in 1957, a time when Borger was a booming town on the High Plains. The unique structure quickly became a central part of the flourishing city and within less than a decade it was incorporated into the City Seal, where it remains centered to this day. It’s a small piece of history and a symbol from the period of Borger’s prosperity that contributed to Borger earning the prestigious “All-American City” award from the National Civic League. Borger remains the only city in the entire high plains region to hold the coveted moniker. The Dome is equally as unique as it is the oldest of the remaining Kaiser Aluminum Domes and was the first Kaiser Dome constructed in the continental United States. Plans to restore and improve the Borger Aluminum Dome and bring a piece of the community’s past into its future are already underway. The city is working directly with local architectural and engineering consultants, Parkhill, Smith & Cooper (PSC), to plan these renovations and expansions. Initial goals include waterproofing, acoustical improvements, complete HVAC systems with modern electrical and lighting systems. Facility expansion could include new restrooms, a catering kitchen and a banquet hall. The structural system of the Borger Aluminum Dome is considered unconventional and no known structural drawings or other documents related to the original construction of the building exist. Subsequently, some integral structural specifications are unclear, and therefore require expert comprehensive analysis. With approval from the city, Parkhill, Smith & Cooper has executed an agreement with a material science consulting firm based in Irving, Texas. Wiss, Janney, Elstner Associates Inc. (WJE), is contracted to provide this analysis and initial condition assessment services of the historic structural and waterproofing systems. WJE has expertise in assessing unique structures such as the Borger Aluminum Dome and have recently provided consultation services for other iconic structures like the Washington Monument in Washington D.C.